This week brings more color to our elevation (2,300 feet), and it looks like peak color at elevations around Asheville and Black Mountain, NC, will be happening over several days through the very end of October. As usual, we are still waiting on the oak trees! Gah! However, other tree types, such as sugar and red maples and sassafras, are beginning to change more rapidly. As it stands, this year’s predominant fall color is velvety gold, with birch, beech, hickory, sassafras and others providing different shades of yellow, bronze, and yellowish-orange. Early changers, such as sourwood, dogwood and sourgum are still showing color (mostly red hues) while tall tulip poplars are now bare after a rainstorm on October 14th caused their brown-tipped yellow leaves to drop. The best color this week can be found at elevations between 2,500 and 3,500 feet. 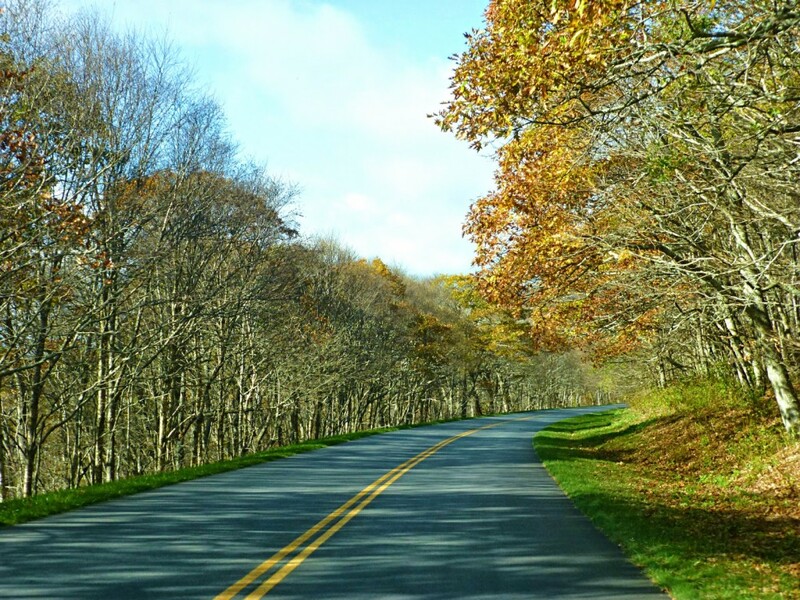 Most areas of the Blue Ridge Parkway north and south of Asheville are at elevations above 4,000 feet and are past peak or just past peak, but several overlooks give you an opportunity to see color below you. Past peak near Craggy Gardens, but still a tree-lined drive! Temperatures are turning much cooler above 4,000 feet as well, so if you want to get out for a hike along higher elevations, the views will be great, but be sure to wear layers (and don’t forget to stay hydrated). 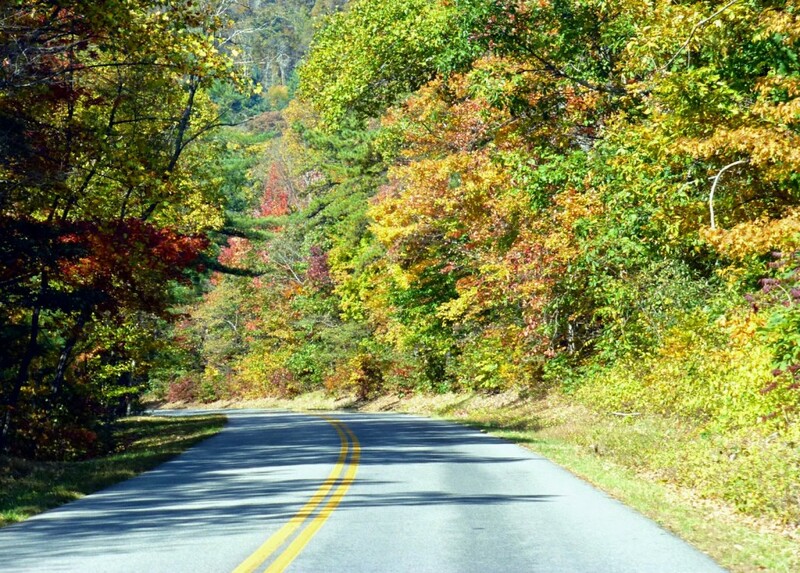 Linville Falls – take Highway 221, which is a gorgeous drive this time of year, to Linville Falls, and enjoy hiking along the Linville River, with great views of the falls. Linville Falls is about 45 minutes northeast of the Inn on Mill Creek. Blue Ridge Parkway north between Asheville and Craggy Gardens – at roughly 2,000 feet in elevation, Asheville is still waiting for peak to arrive. And Craggy Gardens above 4,500 feet is now past peak. Between the two is a burst of fall color as the peak hits elevations between 2,500 and 3,500 feet. A nice hike in this area is off of Ox Creek Road near Blue Ridge Parkway Milepost 375. 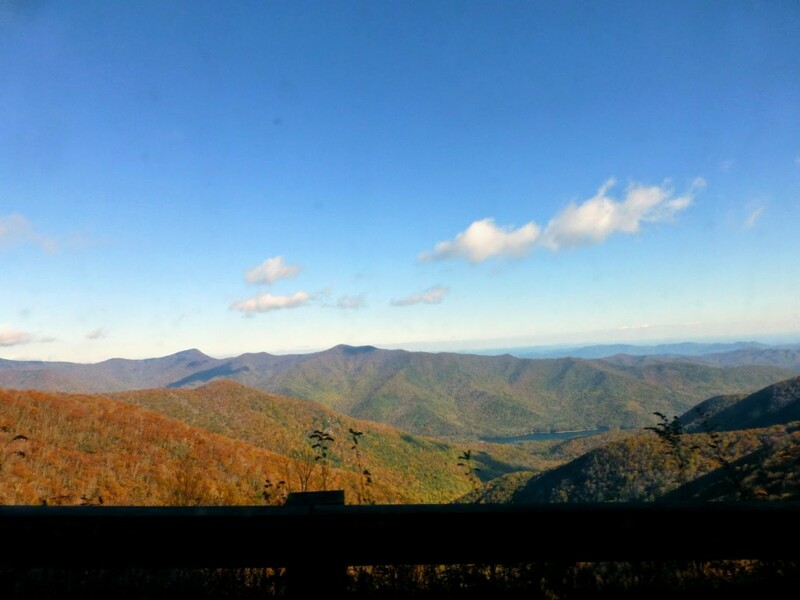 While driving on the Parkway north from Asheville, you’ll see a sign for Weaverville; turn left there and then stay to the right to continue on Ox Creek Road. Along the way are a couple of parking areas on the right for 2 to 6 cars. Take the trail heading to the left and check out the remains of the Rattlesnake Lodge site. The trail to Rattlesnake Lodge from Ox Creek Road is a little over three miles round-trip and easy-to-moderate. 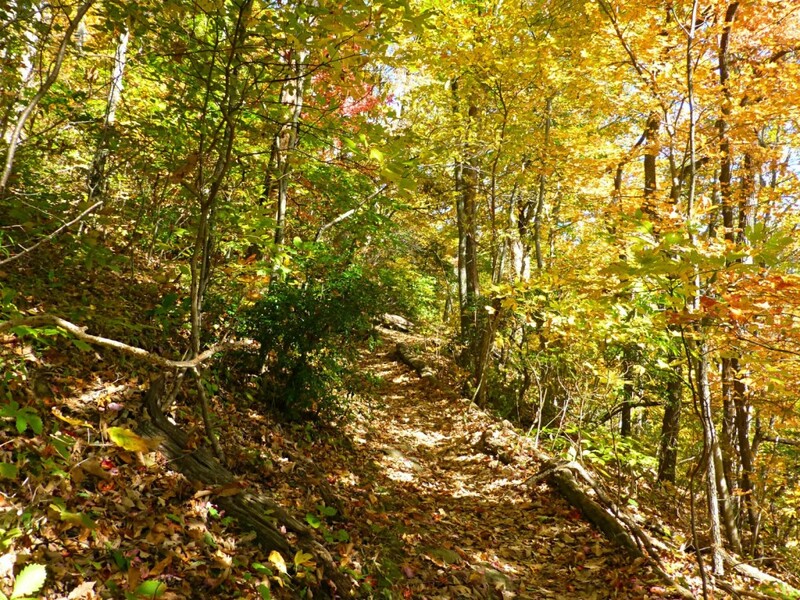 Rainbow Road Trail in Montreat – Montreat is just 5 minutes north of the town of Black Mountain. The Rainbow Road Trail is one of many trails at Montreat and is one of our favorites, leading through Rhododendron thickets through beautiful forested land. If you want something a little more challenging, try the Rainbow Mountain trail, which connects to Rainbow Road. 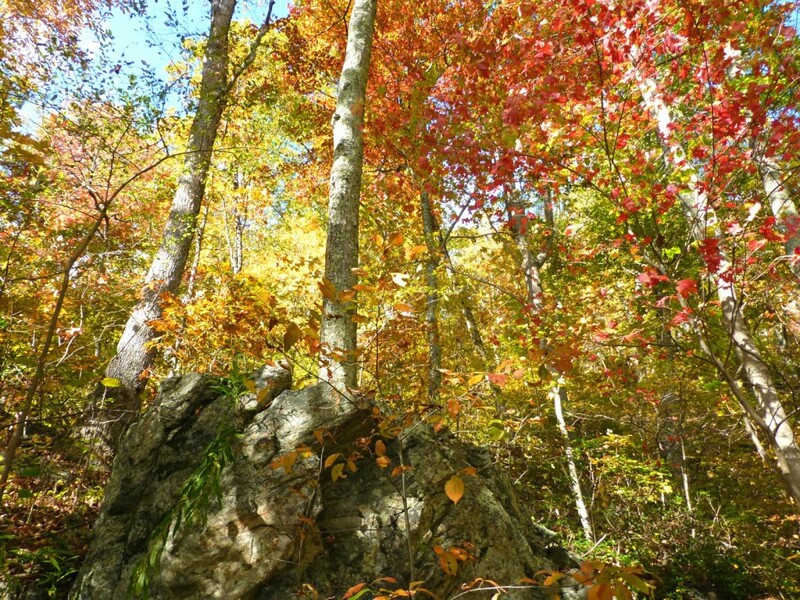 This entry was posted in Uncategorized and tagged Autumn / fall foliage, Blue Ridge Parkway, hiking, outdoors by Inn on Mill Creek. Bookmark the permalink.